Living near the Delmarva region of the United States, we are regularly offered outstanding crab dishes. A few of my favorite restaurants at the Delaware and Maryland shores have some tasty crab offerings. And based on those yummy dishes, I’ve come up with my own Succulent Crab Cakes! Easy to make, and super delicious, you can serve these crab cakes in a number of ways. 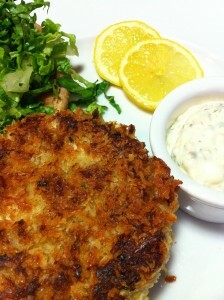 One of my favorite crab cakes is served at Patsy’s Restaurant in Bethany Beach, Delaware. Meaty, and full of chunks of jumbo lump crab meat, Patsy’s crab cakes are offered in a few different preparations. 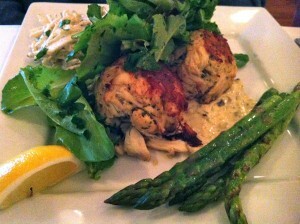 From the main menu, order two large crab cakes served on a celery root and Granny Smith apple remoulade topped with an herb salad and roasted asparagus. 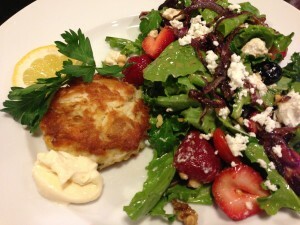 My favorite crab cake dish at Patsy’s is the Key West Salad. 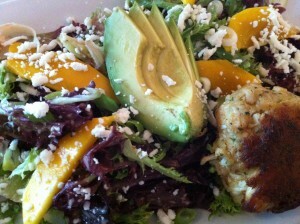 Cool mango, avocado, and fresh mixed greens marry well with the optional addition of a hot crispy crab cake on top. 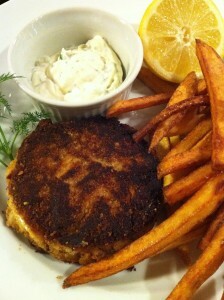 I first fell in love with Patsy’s crab cakes a few years ago when they were served over a bed of sweet potato fries. Yum! Locally, my Whole Foods Markets offer store-made crab cakes at their fresh seafood case. Normally, I make my own crab cakes…but Whole Foods Market’s are pretty good (and sometimes they go on sale)! Fresh crab tends to be expensive depending on where you live. You can use the more widely available pasteurized crab that is packed in containers. You can make a crab cake burger sandwich by placing the crab cake on a bun. 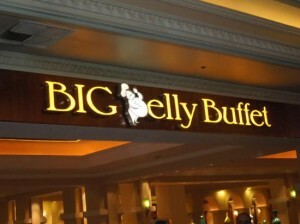 Offer my tartar sauce and the usual lettuce and tomato slices. So how to make my crab cakes? Just lightly mix together some mayonnaise, a beaten egg, crab meat, breadcrumbs, minced parsley, and Old Bay seasoning. Form the mixture into crab cakes. Don’t use too much filler, just enough to hold the crab meat together. Refrigerate the crab cakes for about an hour. Then saute or bake them to perfection. 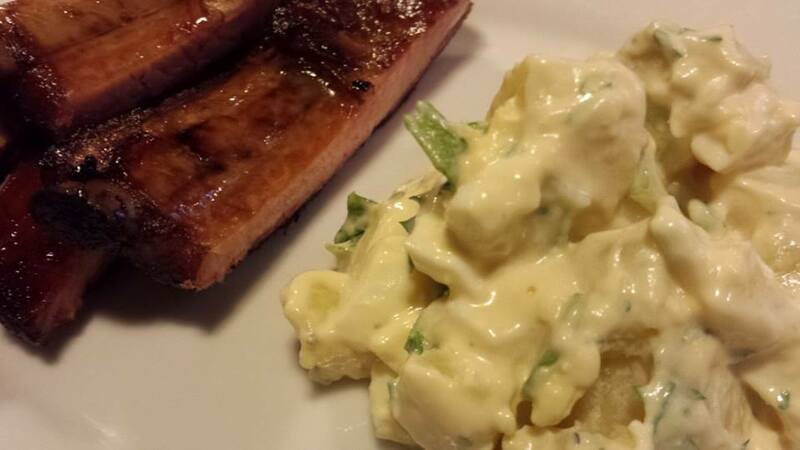 And, as mentioned, you can serve either as a sandwich or as a main course with various side dishes. 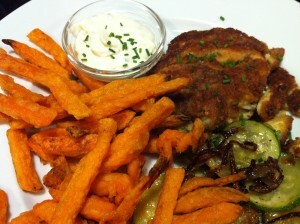 Sweet potato fries go great with crab cakes. Grilled garden vegetables are a healthy choice in summertime. Also, you can try a crab cake Caesar salad. The possibilities are endless! 1. Lightly combine all ingredients (except canola oil) together in a non-metallic bowl being careful not to break up the crab pieces. 3. Cover with plastic wrap and refrigerate for an hour. 4. To saute the crab cakes, heat 1 T canola oil over medium heat in a non-stick skillet and cook until crab cakes are browned, and cooked through. 5. To bake the crab cakes using the parchment-lined baking sheet, preheat an oven to 400 degrees. Bake the crab cakes for 8 – 10 minutes or until browned and cooked through being careful not to burn the bottoms. You can broil the tops if they are not browned enough. 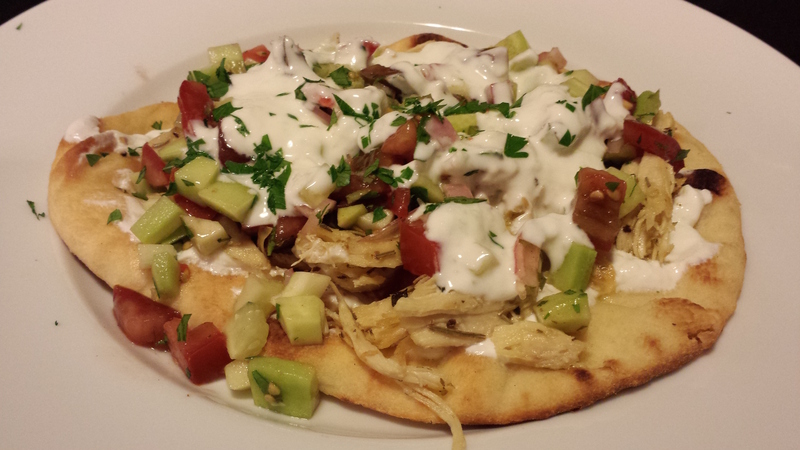 Serves 4 as a main course. 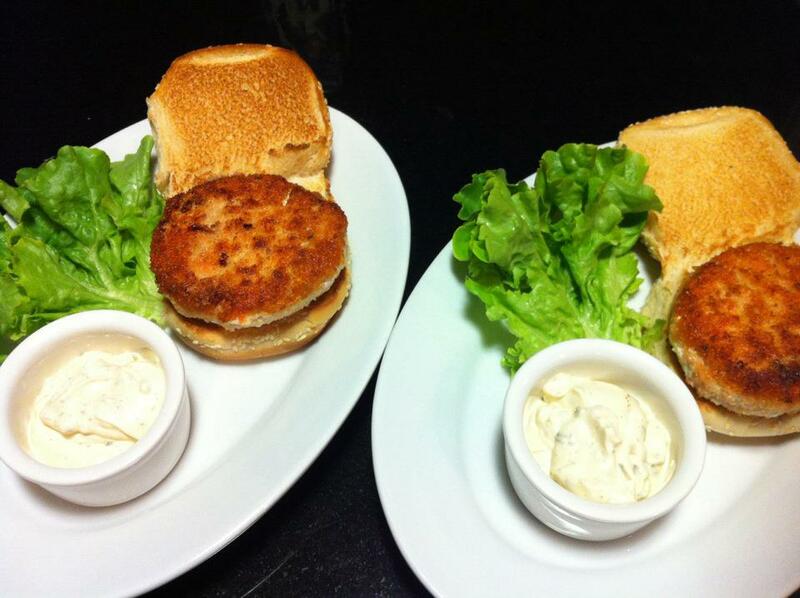 Crab cakes can be served as a sandwich on a bun, or as a main course along with a green salad. Offer my tartar sauce or cocktail sauce for the crab cake burger. 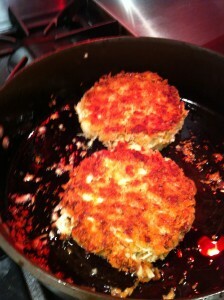 Variations: Coat the crab cakes in additional breadcrumbs before cooking for a different texture. 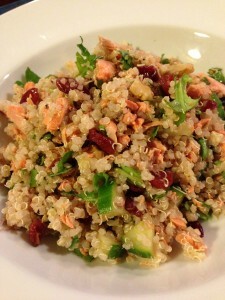 To lighten this recipe, use low-fat or fat-free mayonnaise instead of regular mayonnaise. You can omit the egg if you wish. Switch out the parsley for some fresh tarragon or chives.